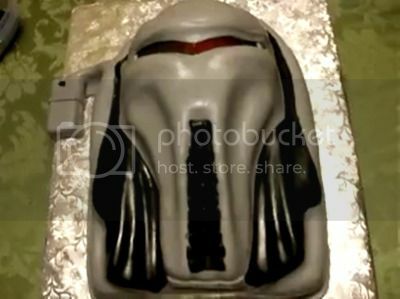 Sure, it’s not as clever or artistic as previous Battlestar Galactica cakes here on GWS. But what this one lacks in elaborate cake-craft, it more than makes up for with LASER EYES. Ok, so, specifically… the cake has been outfitted with an actual, red “eye” light that moves back and forth, all Cylon-style. Hence the frosting-covered battery/robot-tumor. Check out the video, below, for all the ‘lectric-light-moving action. Obviously, “red ‘eye’ light that moves back and forth” isn’t half as dramatic as “LASER EYE.” And what I lack in laser eye, I make up for with dramatic effect. Via SciFi Wire, who knows a cross between wires and sci-fi when it sees one. * Coincidentally, I love it when you reveal your shortcomings, because it allows me to judge you.